A leaked report into Nigeria's oil and gas industry has revealed the extent of mismanagement and corruption that is costing billions of dollars each year. The report, seen by the BBC, was commissioned by the oil minister in the wake of this year's fuel protests to probe the financial side of the sector. It says $29bn (£18bn) was lost in the last decade in an apparent price-fixing scam involving the sale of natural gas. Nigeria is one of the world's biggest oil producers but most of its people remain mired in poverty. The Petroleum Revenue Special Task Force report is one of several commissioned by the government - and follows an outcry after a parliamentary investigation uncovered a massive multi-billion fuel subsidy scam. 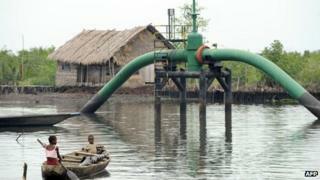 Earlier this week, a campaign was launched to clean up Nigeria's oil sector. The BBC's Will Ross in Lagos says this leaked report exposes the extent of the rot in Nigeria's oil and gas industry - all the way from the awarding of contracts to the sale of refined products. Nigeria's Oil Minister Diezani Alison-Madueke declined to comment on the specifics of the probe but said a report compiled from several committees set up earlier in the year to investigate the oil and gas sector was in its final stages and would be presented to the president soon. This latest damning indictment of the oil sector points out that Nigeria is the world's only major oil producer that sells 100% of its crude to private commodity traders, rather than directly to refineries, paving the way for potential fraud. So the entire system needs to be changed in order clean up the industry. If there is any good news here, it is this: At least light is being shone on a sector which has for decades been kept deliberately opaque. Some will commend President Goodluck Jonathan for showing a desire to expose the rot, but he will ultimately be judged on whether vital reforms are ever made. It is known that stolen money from the opaque oil and gas sector play a vital role in funding Nigeria's political patronage system. For the period 2005 to 2011, it said $566m was owed in signature bonuses - the fees a company is supposed to pay up front for the right to exploit an oil block. Our correspondent says it is well known that oil theft is a major problem in Nigeria, but the report says it may be reaching emergency levels as 250,000 barrels of crude oil could be being stolen every day - 10% of annual production. The leaked report said that small-scale "pilfering" had been "endemic since at least the late 1990s", but it also said it had heard allegations about thefts from crude export terminals, tank farms, refinery storage tanks, jetties and ports. "Submissions to the Task Force alleged that officials and private actors disguise theft through manipulation of meters and shipping documents," the report said. "Yet there is also evidence that members of the security forces condone and, in some cases, profit from theft. The void in effective security likewise appears to increasingly hand over control of coastal and inland waterways to undesirable elements." The investigation showed that 40% of refined products - either refined in Nigeria or imported - currently being channelled through state-owned pipelines are lost to theft and sabotage. Mr Ribadu's investigation calls for a total overhaul of the industry with an oil sector transparency law requiring all companies to report all payments and publish all contracts and licences.